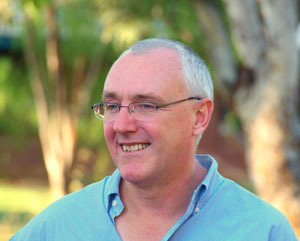 Charles Darwin University Vice-Chancellor Professor Barney Glover has called for a new funding model for regional and remote education, built around the distinct needs of regional Australia. Speaking after a tour of CDU’s regional campuses, Professor Glover said feedback from key staff and industry suggested current funding arrangements were hampering educational quality and consistency in bush communities. “Staff are spending considerable time chasing funding streams that don’t recognise the value of teaching in communities, which our research proves is critical to closing the educational gap,” he said. Professor Glover spent three days visiting community groups across central and northern Australia, where he discussed CDU’s role with local stakeholders. “There was an overwhelmingly positive view of CDU and our efforts to deliver directly into communities where they felt it was most beneficial,” he said. The Vice-Chancellor’s calls are supported by CDU’s Indigenous Community Engagement research that backs community-based delivery in consultation with Indigenous “champions” who help to mentor and endorse the program. “The current funding model doesn’t account for this and assumes technology can fill the gap, but my feedback clearly shows face-to-face learning is still critical for vibrant and job-ready outcomes,” he said. Professor Glover, who joined CDU in February, said he was invigorated by his visit. “Many stakeholders and industry leaders told me of the great value they place on education and share our vision to produce job-ready graduates to help lead their communities,” he said. While acknowledging the logistical challenges of remote delivery, Professor Glover said it was crucial to develop solutions around community needs. “Economic and social prosperity will only come through investment in education that is delivered to the needs of its constituents,” Professor Glover said. “It’s very clear to me that effective and targeted education requires a community-orientated funding and training model and we are keen to talk to government about this,” he said.